The celebration of the 60th anniversary of Lester B. Pearson’s Nobel Peace Prize is in full swing. The first major event is a panel discussion, The Four Faces of Peace: Power, Policy, Prosperity & People, cohosted by Pearson College UWC and Massey College at the University of Toronto on 2 November. We recently received confirmation that Canada’s current Minister of Foreign Affairs Chrystia Freeland will participate in this event, joining four former ministers of foreign affairs, The Right Honourable Joe Clark, Hon. Lloyd Axworthy, Hon. Bill Graham and Hon. Barbara McDougall. 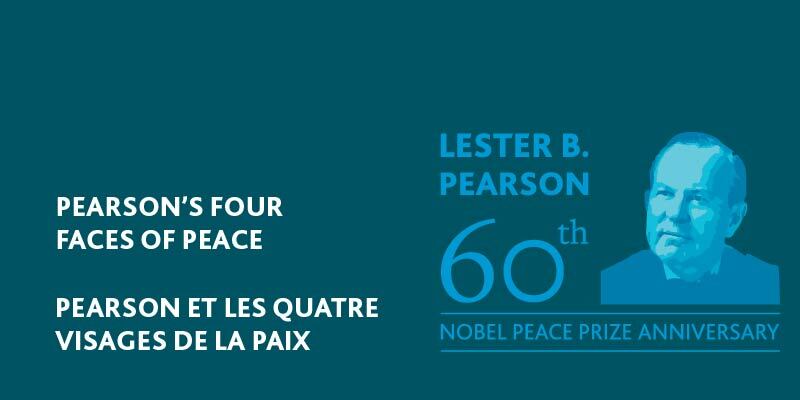 Together, this august group – historic in that we are convening for the first time a gathering of five Canadian Ministers of Foreign Affairs — will examine Mr. Pearson’s legacy in light of his 1957 Nobel Lecture The Four Faces of Peace. The moderator is CBC Senior Correspondent Susan Ormiston. Please consult Pearson’s social media and website for details on tickets for this free event and check here for a livestream link. 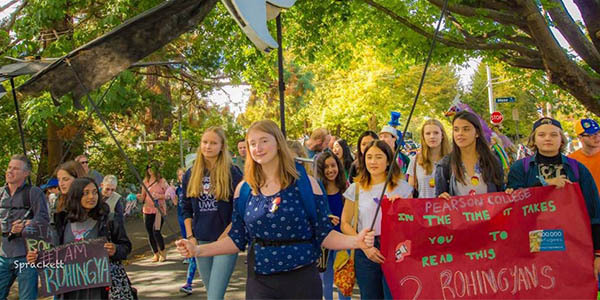 Closer to home, from 17 to 19 November, the University of Victoria and Global Affairs Canada will celebrate Canada’s 150th anniversary at the inaugural Victoria Forum Canada@150: Promoting Diversity & Inclusion. The College is hosting a Friday evening Gala Reception with the theme of Uniting Cultures & Countries through Diversity & Inclusion. Our students will be performing that evening and meeting conference guests during the Forum. 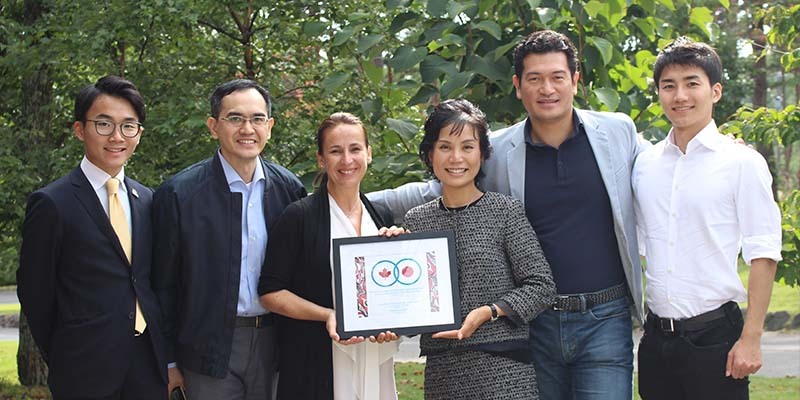 Pearson is well-represented with other attendees including former Board member Hilary Pearson, a College Patron and our namesake’s granddaughter, as well as Pearson alumnus (YR 6/1981, Singapore) and Canadian Senator The Honourable Yuen Pau Woo. We were honoured that on 23 October, Mitzi Dean (Member of the British Columbia Legislative Assembly for Esquimalt-Metchosin – the provincial riding in which the College is located) delivered a statement celebrating Pearson College and the 60th Anniversary of the Pearson Nobel Prize. 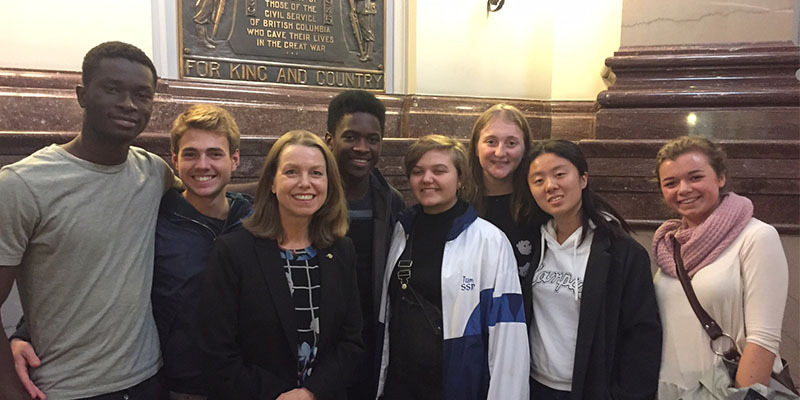 Seven of our students (Tomma Bambara/Burkina Faso; Bryan Nakambonde/Namibia; Guglielmo De Rigo Piter/Italy; Lara Best-Dunkley/Finland; Cindy Gao/China; Anna Beebe/Ontario, Canada; and Tess Casher/Yukon, Canada) accompanied Vice President Dan Hurley and visited the 41st session of the provincial Legislature to witness the event. 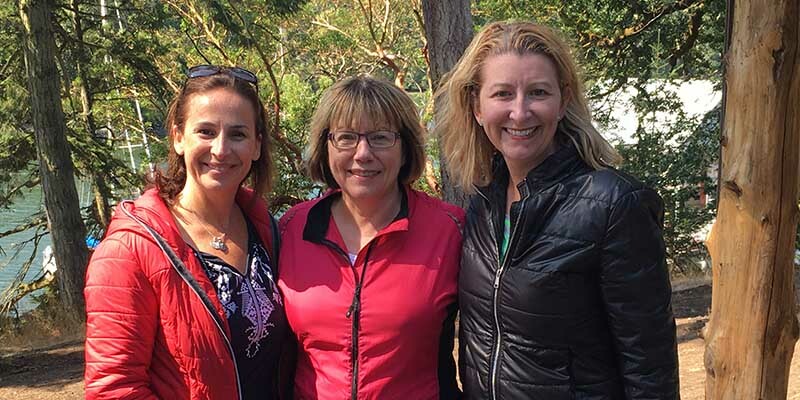 In my Summer Update, I wrote of our joyful anticipation of the 20-year Alumni Reunion (Years 21-24/1996-1999) and the 30-year reunion (Years 12-15/1987-1990). The reunions were wonderful testaments to the strong bonds formed here at the College. The attachment of our alumni to Pearson and the way in which each has made a life-long commitment to living the Pearson values are, quite simply, inspiring. I particularly appreciated the opportunity to hear from many how we can continue to provide a transformative experience for our students and alumni. And I loved how many children – more than 100 – accompanied their alumni parents! Children are such a great social catalyst. Staff organizers and alumni volunteers did a superb job of creating a varied and interesting program. I want to spotlight the 20 Year Alumni-Led Session on HIV-AIDS awareness, which brought together Diveena Cooppan YR 21/1996, an inspired South African Healthcare consultant/filmmaker; Japanese medical doctor/researcher Takeshi Nishijima and Paul Gurney, Canadian pricing consultant to the pharmaceutical industry, both from YR 22/1997. The three facilitated an inspirational discussion about the resilience of HIV-AIDS patients around the world. Every August before students arrive on campus, all Pearson community adults take part in several days of health, safety and wellbeing training to ensure our campus is supportive and welcoming to new and returning students. Jennifer Banton, an educator and expert in English as a Second Language, led a half-day workshop for all faculty on supporting students for whom English is not a first language. We were all reminded that these students are especially primed to learn! I also worked with independent consultant and subject expert Pat Patton to lead the community through a discussion of our updated Respectful Community and related policies that support our commitment to a healthy living, learning and working environment for every member of the Pearson community. In developing these policies, we received important feedback from faculty, staff and students which we incorporated into these documents. I would also like to invite alumni to review and share any comments you have with us about the policies. Please send your comments by 31 December 2017 to: respect@pearsoncollege.ca or call Human Resources Officer Shelley Seysener. 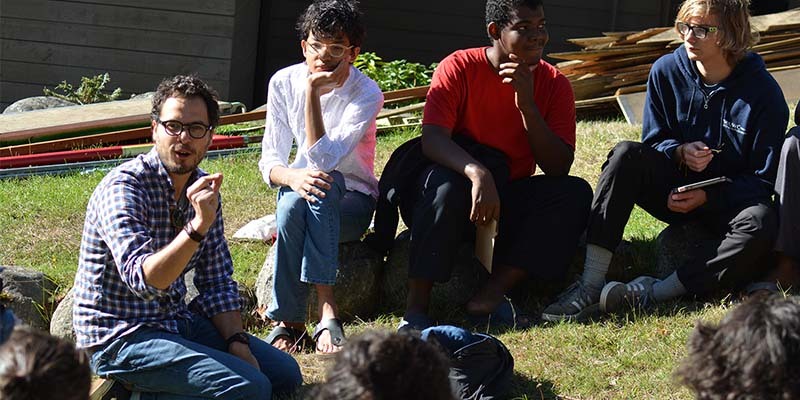 Some students returned to campus ahead of their classmates to take part in a two-week SPELL program (Summer Program for English Language Learning). SPELL enables students to gain confidence in their English-language skills and start their Pearson experience in a supportive environment. First years are supported by six second-year students who were previous SPELL participants. This immersive language experience included fun, participatory activities like karaoke, treasure hunts, board games. From the moment they arrived, all the students were incredibly engaged both inside and outside the classroom. As our first-years settled in to their residences, began to know their roommates, House Parents, housemates and classmates, they were busy with Orientation Week. So many decisions for them to make: working out schedules for classes, fitness activities, choosing artistic and creative opportunities, signing up for jobs (yes, everyone works at Pearson to help maintain the facilities and the functioning of the school as well as gain work experience) and chores in their residence – and, on the Friday of that week, classes started! During that week, I had the great pleasure and privilege of sitting and speaking one-on-one with each of our 103 first-year students, learning so much about them as they told me about their families and communities, and what they dreamed of learning and doing while at Pearson. They are truly impressive! 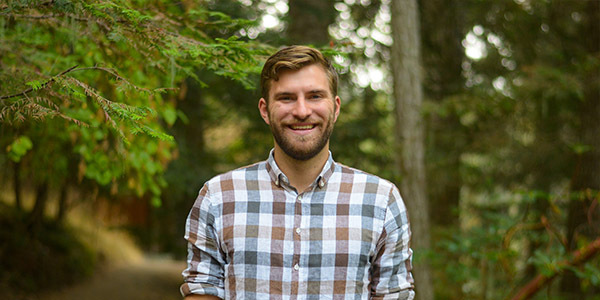 Evan Guy, a native of Victoria (born in Metchosin) and UWC Costa Rica 2014 alumnus, is our first-ever Pearson Fellow. He is currently studying political science and economics at Quest University in Squamish, BC. As he enters his fourth and final year of his undergraduate degree, the focus of his keystone project is developing a thesis about reconciliation, access to justice and Canadian educational institutions. Evan has worked with Pearson over the past two summers, demonstrating leadership and goodwill in supporting our Auxiliary programs and Alumni reunions. Pearson Fellows is a new program we are piloting to engage graduates of other United World Colleges. Inspired by the Jeanne Sauvé Fellows Program and “Residence Assistants” at other UWCs, Pearson Fellows are outstanding young adults living in residence who can serve as role models for our students while providing on-campus support and pursuing their own academic and/or professional projects aligned with the UWC vision and values. On 10 September, students and adults enthusiastically participated in the annual Metchosin Day community celebration. Starting with a 5K run and a follow-up performance by the Pearson choir for an enthusiastic audience, the day was complemented by Pearson community adults and students who shared information and their experiences about the College with our Metchosin neighbors. Adults and students celebrated UWC Day, The Power of Diversity with activities that included a Linguistic Inclusion workshop, dinner with Beecher Bay First Nation, a student-led discussion on diversity and a performance of Peace Like a River by the Pearson choir. Also, check out our students’ participation in Victoria Peace Day. This fall, we have a full roster of inspiring speakers, starting with my ‘Conversation with the Prime Minister of Canada’s Parliamentary Secretary for Youth Peter Schiefke.’ Peter’s engaging discussion of his leadership journey was complemented by a frank account of his successful battle with cancer and how he blends a demanding political career with a happy family life. Our conversation stimulated many questions from the audience and Peter was generous with his time, engaging with students well after the formal session ended. In our 5 October event, Montreal and Cape Town resident Adam Kahane spoke on “Solving Tough Problems.“ An experienced international discussion-leader and problem-solver, Adam discussed “Collaborating with the Enemy: How to work with people you don’t agree with or like or trust,” and pointed out that conventional collaboration is not always possible. By using a stretch collaboration approach the parties involved can experiment with different factors to achieve diverse solutions and might want to embrace conflict. At the 12 October Village Gathering, our federal Member of Parliament Randall Garrison (Esquimalt Saanich Sooke) spoke passionately about his personal and political journey as a strong advocate of LGBTQ rights. Mr. Garrison, a second-term MP, has served this region in a number of roles for several years and, as he pointed out, is a big fan of the College! Every term, we invite alumni to return to campus, either in-person or virtually, to share with current students their “Life After Pearson” experiences. So far this fall, we have welcomed four alumni on campus: Niki Howe (YR 38/2013 Canada ON), Laurie Houston (YR 3/1978, Canada ON), Maurizio Bermudez (YR 1/1976, Columbia) and Hernán Jiménez (YR 23/1998, Costa Rica). Each brought a unique and informative perspective to share. Be sure to regularly check our website, social media and eNews for updates and more stories about alumni. 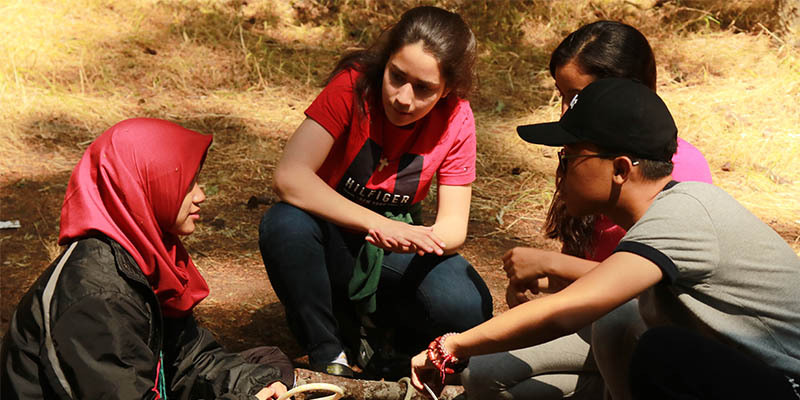 At the heart of the International Baccalaureate Diploma Program, Creativity, Action, Service (CAS) involves students in a range of activities that take place alongside their academic studies. A core component of the program, CAS Week enables students to pursue the College mission outside the classroom by creating and carrying out their own projects. This year, for example, students worked at local homeless shelters, helped out with Habitat for Humanity programs and undertook rigorous wilderness expeditions and marine science initiatives. Check out our social media platforms for some of these stories. Like many of you, I have been following with great interest the voyage of Canada C3, an epic 150-day coast-to-coast-to-coast expedition to celebrate our country’s 150th anniversary. What an amazing adventure! I hope you have read the alumni blog of Trevor Corkum (YR 18/1993), who participated as writer-in-residence on leg 6 of the voyage. And have you seen the video from Benoît Dupras (YR 41/2016, Canada-QC), who was the youth ambassador on one of the journey’s legs? On 28 October, when the C3 ship pulled in to Victoria, her last port of call, our students were part of the welcoming group! In mid-September, as students settled into their routines, I resumed my outward-facing role representing Pearson at conferences and public events, meeting with potential sponsors and donors, and raising the profile of Pearson as Canada’s School for the World and of the UWC and our collective global mission. After a packed schedule of meetings in Ottawa and Montreal with government officials and other key stakeholders, I flew to Tokyo for the official opening of UWC ISAK Japan. 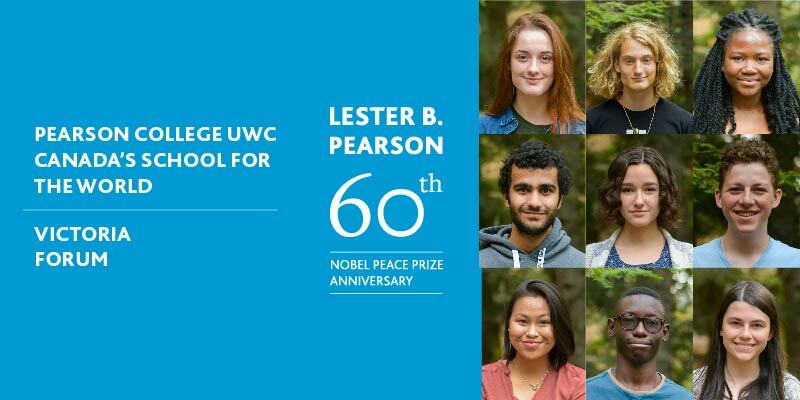 There is a very special connection between Pearson and ISAK, as Pearson alumna Lin Kobayashi (YR 18/1993, Japan) is UWC ISAK’s founder and Chair of the Board. Physics teacher Ryan Murphy (YR 26/2001, Canada-NL) also taught at Pearson and, together with his spouse Raïsa Mirza (YR 31/2006 Canada ON), cohosted a gathering of local Pearson alumni. It was an opportunity to connect with fellow Heads of College and representatives of National Committees while savouring the joyous occasion, crowned by the announcement by philanthropist Shelby Davis that he would donate $1 million in matched funding to UWC ISAK to honour the occasion. All of us at UWC owe much to Mr. Davis. Less than a month later, I was off again, first for meetings in Montreal and Ottawa and then, with Vice President Heather Gross, to attend the Heads of College and UWC International Council meetings hosted by UWC Robert Bosch College in Freiburg, Germany. Back in Canada, I went directly to Alberta for the annual Banff Forum, which brings together major influencers, decision-makers and funders with young and emerging Canadian leaders across all sectors to enhance their leadership skills and contribution to Canada. A stimulating event with exceptional speakers and members, the Forum never fails to inspire and energize me. Brilliant Pearson alumnus Brett House (YR 15/1990, Canada ON) was a standout on Canada-U.S. relations. Very shortly, I will be heading to Toronto for The Four Faces of Peace event, followed by the Pearson College UWC Annual General Meeting on 3 November. As we look forward to the AGM in Toronto, I want to draw your attention to the important work of our volunteer Board of Directors, the bedrock of the College’s governance and source of wise guidance to the College leadership. The list of past directors is a Who’s Who of outstanding Canadian leaders, all of whom have given their time and unstinting efforts to the betterment of the College in every way. We owe them a deep debt of gratitude. My great thanks to Nina Moroso, Board Secretary and Governance Officer extraordinaire, who is now working full-time as UWC National Committee of Canada (NCC) Coordinator – they are very lucky to have her! I would particularly like to pay tribute to our outgoing Chair, Tony Macoun, who has devoted his entire professional life to leading schools and guiding youth in Canada and overseas. Tony came out of retirement to take on this volunteer position at a critical time in the College’s history, putting in countless hours and selflessly contributing his skills, network, experience, and solid leadership. His wisdom, guidance and support have been invaluable to me personally and to the entire Pearson community. He will be greatly missed! I also wish to acknowledge and thank Dr. Jean Drouin, our outgoing Vice Chair and Chair of the Advancement Committee of the Board, who has consistently provided counsel and enthusiastic support. Last, but certainly not least, I want to warmly welcome our new Chair, The Honourable Anne McLellan, who brings to us her tremendous leadership, knowledge, network and savoir faire. Christine Healy (YR 15/1990, Canada-NL), the incoming Vice Chair has done an outstanding job as Chair of the Risk Management Committee. As several people have noted, this is an historic milestone for Pearson as the Chair, Vice Chair, Head of College and Chief Academic Officer are all women!